No matter if it’s newspaper, book on tablet or actual book with pages and cover, people read daily. Not everybody can spend some space on library or study though, so be creative and find a corner that can be conquered by your favorite books. Search for space. Depending on your idea, look for a space that can accommodate it. If big comfortable armchair and shelves of books, globe and maps are what you desire, you’ll need to separate sufficient space. If you want just to hide and read, one niche is more than enough. Choose design. Depends on the interior of the whole room and on your idea. 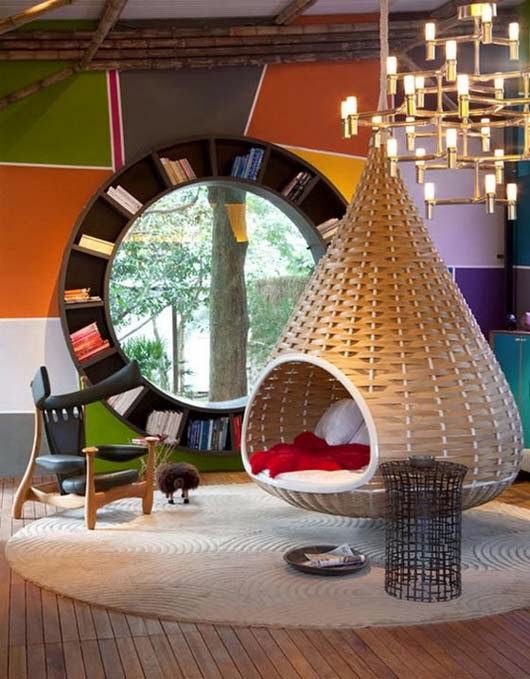 Do you want to make the reading area focal point or you want it to be part of the whole? Choose classical furniture and patterns or get ultra modern space lines with those curvy shelves and arrange a space that you’ll enjoy. In the hallway?! If the kids are not too noisy, hallway can be used for reading or work, if you have extra space. Lay down a rug for separation from the rest of the room and put comfy chair and a stand or table for your books. For the heavy furniture fans: carpet cleaning specialists would advise you to use padding to keep the fibers from damaging. Behind the curtain. Unused closed can be easily transferred into mini library. Instead of armchair, put a low cabinet with seat on the top. Put pillows around the sides to make it comfortable for relaxing and install some lights. If you have space left, use it for book shelves and accessories to make your reading area even cozier. Use curtain or door to get fully separated from the rest of the space. Keep the lightning in mind. It’s essential part because insufficient light can easily damage your sight. If you have windows near, perform regular window cleaning to let more light in. Don’t hesitate to add also extra artificial lightning. Anything that will make you feel more comfortable is allowed. Reading is one of the abilities that we acquire in our earliest age and we learn to explore the world through it. Although technologies are trying to replace it, still this joy comes mainly from books. Make place for them at your home, at least as long as we have them.